On a lovely warm Saturday at the start of May, Peter and Gianni joined me in an acoustic trio to travel up to Echuca and play for Michelle and Jason’s wedding. 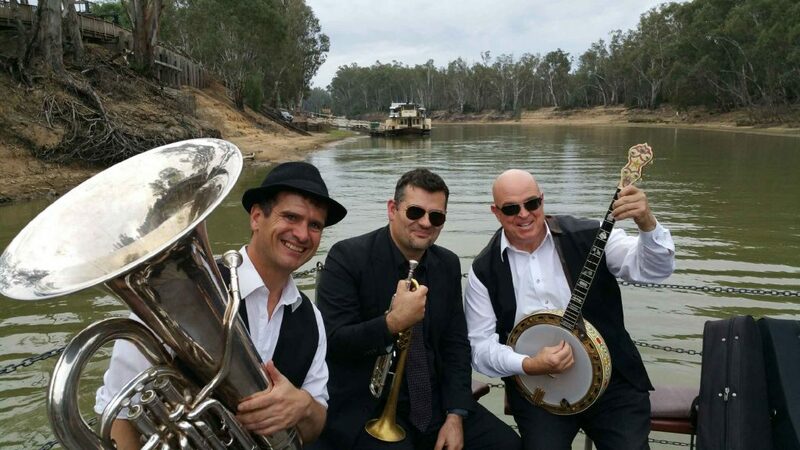 We performed some era-appropriate music on the wharf as guests arrived and mingled, and then we sat on the stern of the historic paddle steamer Pevensey for another few hours and entertained the guests as they (and we) enjoyed an idyllic cruise up and down the Murray River. The steamer didn’t make it into the video, unfortunately, but you can hear it docking behind us during the last tune. One of the great things about having live music in an outdoor setting like this is that the spirit of celebration gets shared not just with the guests but with anyone else who happens to be nearby. It was great to see kids fishing on the riverbank, people relaxing on houseboats or walking their dogs getting a nice surprise and giving us a wave as our floating performance chugged by! Thanks to Michelle and Jason for having us, and best wishes for your life together! This entry was posted in Uncategorized and tagged banjo, recent gigs, trio, trumpet, tuba by Dan. Bookmark the permalink.